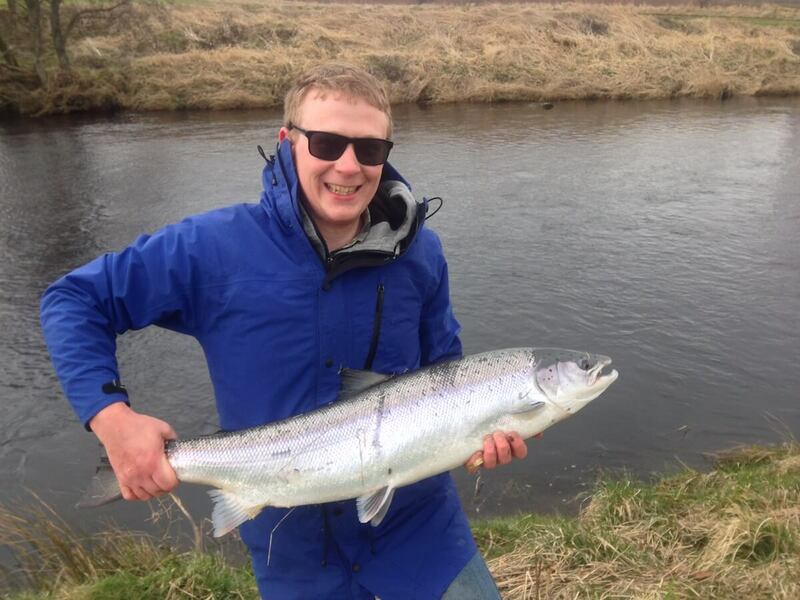 Nathan Krelle writes about his recent trip from Australia to Scotland and fishing the Deveron. Scotland has always seemed like a magical place to a boy from the antipodes. As a young child it was the excitement and awe of reading about fierce Scottish warriors in their castles, and the untamed beauty of the highlands, lochs and glens. Growing older brought an interest in Scottish engineering and academic exploits; and an appreciation of the whisky exports. Fast-forward to 2018, and finally a boyhood dream of exploring Scotland was realised. My wife Felicity and I visited Scotland for the first time in March/April this year, travelling from Melbourne, Australia. As a ‘dream destination’, we decided to spend our 18 days solely in Scotland; self-driving ourselves on a tour to see as much of the country as we could. After landing in Glasgow, we travelled north to Loch Lomond, and the following day around to Tarbet. We hit our first obstacle when it was discovered that the ferry to Islay was fully booked for vehicles over the Easter weekend; so we resolved to carry on as foot passengers (which, on an island boasting no less than eight distilleries, wasn’t such a bad thing). With the assistance of the amazing Emma Clark at Glenegedale House, the local bus service and a friendly local lorry driver, we were able to make it to our target destination of Bunnahabhain distillery (amongst others). After Islay, we continued north to Oban; sampling the exquisite local seafood at the Green Shack, before continuing on to the Isle of Skye. From beautiful clear mornings to being snowed-on at the Old Man of Storr, we explored Skye before heading east to Inverness and Aberchirder beyond. We’d now reached the portion of the journey reserved for fishing. Salmonids are a bit of an exotic beast where I grew up, about 4 hours east of Melbourne, Australia – so it’s really only been in the last seven or eight years that trout and salmon fishing has become a favoured pastime. My wife is a Kiwi, and every chance we get to visit the family in Christchurch is an opportunity to get out for a fish (the trout and salmon fishing in New Zealand is truly spectacular). In some respects our choice of fishing the River Deveron was pure luck; having only Google as a reference, we started out searching for trout and salmon rivers throughout Scotland. Whilst rivers such as the Spey looked spectacular there was something altogether more ‘manageable’ about the Deveron (particularly where travel rods are concerned), and combined with the location and holding the record of Scotland’s largest fly-caught salmon it seemed like the perfect choice. We had booked a day of fishing at Coniecleugh on Friday. The Thursday driving into town was beautiful; warm, with clear skies and barely a breeze. Friday was the polar opposite; freezing cold, windy and continuously threatening to pour with rain. But we’d made a commitment, and we were going to see it through. We were shown over the beat by Robbie Brown, who gave us a few tips on the preferred tackle, before setting out into the cold. It was about an hour in before the first signs of life; a strike from a large brown trout in fast water. But a practiced shake of the head threw a poorly seated hook without any trouble, and he darted off to safety. The next half an hour brought nothing but the risk of hypothermia, so it was back to the hut for a cup of tea. With feeling once more returned to the extremities, it was down towards the rail bridge. The first fish landed was a feisty brown, about a pound and a half, landed on a black and copper Celta. Venturing on, the next fish was another brown; this time two pounds, and caught on a red and gold Celta. Another half an hour or so, and several lure changes later, another brown; this one larger still at two and a half pounds. By this stage we were quite happy. Despite the cold we’d landed some nice fish, and our thoughts were starting to wander to hot food in front of the fire. And then it happened. Casting past a likely looking boulder, the lure caught up on something that felt like a soft snag; perhaps a bit of weed. But in a moment annoyance turned to glee as a rippling silver shape billowed in the water. It was a fish. A very big fish. As the line screamed off the reel, all I could think of was the leader; as much as I’d dreamed of catching a salmon on the Deveron, all I was expecting was trout – and was fishing 5lb accordingly. I gingerly played the fish, gaining a few feet before another run; eventually reaching the point where I was gaining more than I lost. After about five minutes my thoughts changed from “don’t lose this” to “how the heck am I going to land this”. The bank was steep, and we weren’t travelling with a landing net. But it was obviously meant to be; the fish tired, and keeping its head up I was able to manoeuvre it in towards the bank where I could swiftly pluck it from the water. After a quick measure and a couple of photos, it was away again; a silver ribbon melting into the depths. At 35 inches it was a personal best – and a Scottish springer to boot! Feeling that it was now impossible to top that result, we returned to the New Inn in Aberchirder for some real ales (and a wee dram of Glendronach) and told our story in front of the fire. All too soon we were on the road again; to Newtonmore and the Cairngorms, a stop for the engineer to ogle the Falkirk Wheel, and finally a tour of Edinburgh before boarding the long flight home. And so the journey was finished; with so much yet unseen, and so many whiskies untasted. But the boyhood dream of seeing Scotland had been satisfied, for now, and the memory of that fish would never be forgotten!